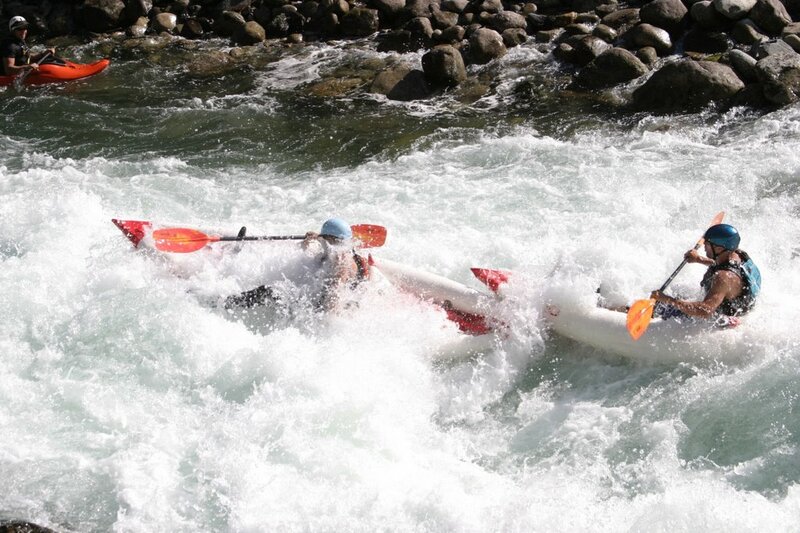 The International Rafting Federation maintains a ‘Top 10 Most Improved Rivers’ list. Included in the list are those rafting rivers which were once considered to be threatened or endangered, but have since been added to ‘protected rivers’ lists, have had dams removed, have been cleaned up, or the government and/or local community is actively involved in creating recreational opportunities where there were none. You can also read about TOP 10 MOST THREATHENED RIVERS. The Futaleufú River is fed by glacial and snow melt in the Andean lakes region of Argentina and Chile. Cutting through the volcanic mountain range, the river gorge drops as low as 1700 meters (5500 feet) below the surrounding glaciated peaks. The Futaleufú is a river in northern Patagonia fed by the lakes in the Los Alerces National Park in Chubut Province, Argentina. The river originates in Amutui Quimey Lake in Argentina, then flows 35 km to the border and enters the Palena Province of Chile, in Los Lagos (X) Region. On the Chilean side, the Futaleufú River has three major tributaries, the Rio Claro, which originates in the neighboring Futaleufú National Reserve, the Rio Espolon, and the Rio Azul. The Futaleufú watershed also includes several pristine Patagonian lakes such as Lago Espolon, Laguna Espejo, and Lago Lonconao. Improvement: Several Chilean as well as international non-profit organizations joined forces to fight the multinational corporation Endesa large-scale hydroelectric project and protect the natural areas and communities of the Futaleufú watershed, regarding the area as an international treasure. In October 2014, citing international opposition, Endesa removed the Futaleufú from its list of future projects. Improvement: The stretch of the Magpie River south of the planned biodiversity reserve has potential for hydroelectric development that Hydro Québec would like to harness on both a short and medium term basis. However, given both the natural features and the potential for recreational tourism of this site, the BAPE (Bureau d’audiences publiques sur l’environnement) has recommended that this stretch of the Magpie River be permanently protected. It is formed by the Cotahuasi River, arising at more than 4,750 m (15,580 ft) ASL in the lake Wansuqucha. It receives the tributaries of the Wayllapaña river in the neighborhood of Pampamarka, to the north, and the Huarcaya near Tumipampa, to the west, and is later joined by the Maran River to form the Ocoña River(Chaucalla village) that ends at the Pacific Ocean. Still untouched in Natural reserve: The Cotahuasi Subbasin is a landscape park set up by a 2005 decree. It covers 1,212,175 acres. This natural reserve preserves an integrated environment where man and nature are living in close harmony, in a preserved cultural microcosm. The difficult topographic conditions have generated specific landscapes like agricultural terraces. The Nahatlatch’s River originates in the Lillooet Ranges. It flows southeast, the northeast, collecting tributaries such as Mehatl Creek, Tachewana Creek, and Squakum Creek. It flows through Nahatlatch Lake, Hannah Lake, and Frances Lake. After the lakes the Nahatlatch River flows generally east to join the Fraser River in the Fraser Canyon. Cutting through the largest wilderness area in the Lower 48 is the Middle Fork of the Salmon River, the longest undammed river in the United States. The Middle Fork is one of the last free flowing tributaries of the Salmon River system. One of the original eight rivers in the nation designated as Wild & Scenic on October 2, 1968, the Middle Fork of the Salmon River originates 20 miles northwest of Stanley, Idaho, with the merging of Bear Valley and Marsh Creeks. The designated segment extends 100 miles from Dagger Falls to the confluence of the Middle Fork and the Main Salmon. The Middle Fork is one of the last free flowing tributaries of the Salmon River system. Because of its remote location, man’s presence in the area was somewhat limited, leaving it in the condition we see today. Only a few trails, landing strips, private ranches, and Forest Service stations are evidence of man’s intrusion. 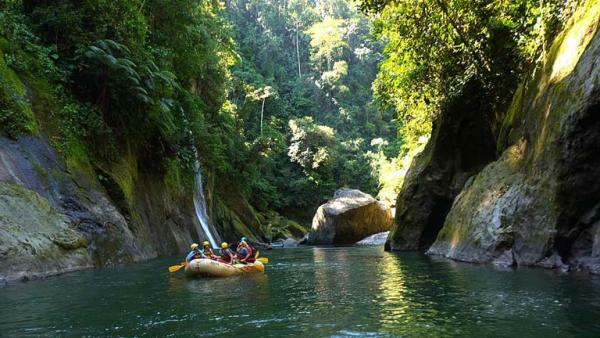 Río Pacuare,and flows approximately 108 km to the Caribbean. It is a popular location for white water rafting,whitewater kayaking and riverboarding. The rainforests that surround the river are home to exotic animal species such as jaguars,monkeys, ocelots, and a very large number of birds. Also it was considered one of the 5 nicest rivers to practice rafting. Improvement: The Instituto Costarricense de Electricidad – Costa Rica’s state-owned electricity agency – suggested in 1986 the possibility of building a hydroelectric dam on the river. This plan was finally rejected in 2005 due to concerns about the pollution and other impacts on tourism and the ecology of the river and its surroundings. The Navua River is located in the island of Viti Levu in Fiji and has its source on the south east slope of Mount Gordon and flows for 65 kilometers to the south coast. It is noted for the scenic beauty of the rugged mountain country through which it flows. In the late 19th century a sugar mill was built on the banks of this river, and although the mill was shut down in 1923, the town of Navua stands on its site. Rivers Fiji is honored to have helped bring Eco-Challenge 2002 to Fiji and to have assisted in creating the most challenging EC venue in history. During the race, Rivers Fiji was responsible for the transport of the hundreds of inflatable kayaks that the individual race participants used on the Upper Navua River, logistical coordination for the river component of the event, supplying raft trips for the media covering the event and safety support for the mountain bike crossing of the Navua River. The Upper Navua Conservation Area is an area in the central highlands of Viti Levu where the Navua River passes through a narrow gorge. It is managed by the Fiji Native Land Trust Board. The area was listed as a “Wetland of International Importance” under the Ramsar Convention on April 11, 2006. Deep in the Alaskan wilderness, the Tatshenshini River lays at the heart of the Tatshenshini-Alsek Wilderness Park, encompassing over 27 million acres and five U.S. and Canadian parks and preserves. Bound by two towering mountain ranges — the Alsek and St. Elias — the Tatshenshini is a river forgotten by time. The rafting trip begins in a lake of ice flows, and then runs toward the ocean, merging with the Alsek River. 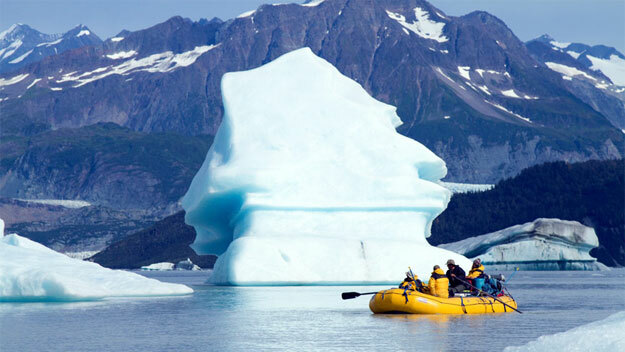 This one-of-a-kind adventure then leads onto a glacier of moraines and frozen falls and finally into the shadows of ship-sized icebergs and the terminus of Alsek Bay. Improvement: The Tatshenshini and Alsek rivers were declared a UNESCO World Heritage Site in 1994 for the spectacular glacier and icefield landscapes as well as for the importance of grizzly bear, caribou and Dall sheep habitat. The Río Cahabón (Cahabón River) is 196 km long river in eastern Guatemala. From its sources in the Sierra de las Minas range in Baja Verapaz it turns north and then east into Alta Verapaz, running through Santa Cruz Verapaz,Tactic, Cobán, San Pedro Carchá, Semuc Champey and Santa María Cahabón below which it joins the smaller Polochic River. Approximately a third of Guatemala has been declared a protected area as a result of either the cultural significance or its biodiversity. The Manas River ( in Bhutan Drangme Chhu) is a transboundary river in theHimalayan foothills between southern Bhutan and India. It is the largest river system of Bhutan, among its four major river systems; the other three are Amo Chu or Torsa, Wong Chu or Raidak, Mo Chu or Sankosh. The total length of the river is 376 km (234 mi), flows through Bhutan for 272 km (169 mi) and then through Assam for 104 km (65 mi) before it joins the mighty Brahmaputra Riverat Jogighopa. National reserves: The river valley has two major reserve forest areas, namely the Royal Manas National Park (43,854 hectares), established in 1966) in Bhutan and the contiguous Manas Wildlife Sanctuary (391,000 hectares) in 1955 increased to 95,000 hectares) in December 1985) encompassing Project Tiger Reserve, an Elephant Reserve and a Biosphere Reserve, which constitutes a UNESCO World Heritage Sitedeclared in December 1985. The Lower Drangme Chhu gorge is perhaps one of the finest sections of Class III whitewater in the world, with beautiful scenic views and untouched forests carving through terrain only the most adventurous travelers have experienced.